NO DRAMA! Travelling by myself I wanted a port close to home for my first cruise, Cape Liberty worked fine. , After seeing the layout I will probably drive there and use the parking garage. For a first trip I used a hire car to and from. Not having to do the driving can be a plus, personally I enjoyed the treat. The timing on the cruise was great, I finished my seasonal job the end of November, boarded Anthem of the Seas on 6 December, returned on 10 December. The only "drama" was leaving my dogs in the kennel (they forgave me). My cabin was 6230, a single studio with a "virtual balcony," which worked fine for me. I was out and about most of the time. Very little noise in that location, except for the occasional opening and closing of the neighboring doors. Cabin attendant for that area was great, cleaned the room twice a day, very pleasant and helpful. All the shows were good, I liked the Cabaret in Two70, a multipurpose theater in the stern of the ship. Music was a bit loud, but the cast is great, high energy. Carrying almost 5,000 passengers some areas get crowded and some groups can be a bit loud. Having said that, there are also numerous quiet areas where you can unwind a bit. I&apos;m not a bar person, they have plenty of bars, and the crowd in them is pretty typical of any bar. They get loud. There is a pretty wide choice for dining, snacks, etc. Casual or dress up, what ever floats your boat. Getting on and off the ship, aside from waiting with almost 6000 other folk, was pretty smooth. For the short trip I got by with a carry-suitcase and a small pack for my electronics, camera and such. Made on and off a bit easier. Decks 4 & 5 tend to be crowded, picture your local "mall" on the weekend. Stores, bars, cafe, pizza,, guest services, etc. Too loud and crowded? Pick another deck, indoor pools, outdoor pools, running track, etc. Fun just to stroll (good exercise if you use the stairs) and explore the features of each deck. 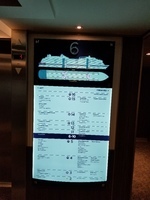 Signs in each lobby and throughout the ship to keep you orientated. North Star is the pod that rises up to 300&apos; above the sea. Sign up early you are limited to one trip, I did it "at sea" which was great, however I would have preferred "in port" after we docked in Bermuda. They also had it up once we cleared the Verrazano Bridge, going under the bridge the smoke stacks clear by about 17 feet. The crew? GREAT, knowledgeable, polite, well groomed, helpful, experienced, well trained and those that I had a chance to talk with all liked their job and their ship. 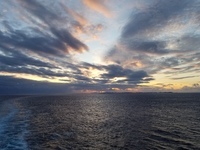 Getting off the ship went well, one area that could be better for a newbie like me .. the handout "Three Tips for an Easy Departure" will arrive the day before you dock. (you get all sorts of literature delivered to your door)The instructions for departing the ship was a tad vague ... "proceed to your assigned waiting area on deck 5" Unfortunately they don&apos;t tell you where your assigned area is, nor how to find it .. that is where the on-board TV system comes into play, a departure schedule is available by time groups depending on the amount of luggage you decided to lug. It is by luggage tag number if you are using checked luggage, or by two time slots if you can carry it yourself. During the trip you can access a lot of information (including shopping, which they stress in every talk .. sell, sell, sell) but that&apos;s typical resort fare. Menus, schedules, show information, etc. can all be found on the TV and "Cruise Compass" which is delivered daily. You initially download your "set sail pass" which gets you on the ship, at your room you will find an envelope with a plastic card, your "Sea Pass" which serves as door key, charge card, and ID to exit and return to the ship. 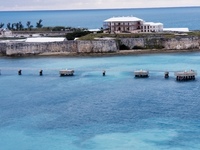 Bermuda, we did pretty good, the sea was calm out and back but most days were overcast, lots of squalls on the horizon. Arrived in Bermuda to bright sunshine (remember sun glasses), lots of shore events, I chose to wander the "museum" which is actually the old fort and commissioners house right next to the cruise docks. Nice way to spend an afternoon, and you can watch the dolphins there too. Overall a great trip, and I&apos;ve started planning for next year. Almost forgot the "Compulsory Guest Assembly Drill," bring popcorn, the movie is great! Great place to sleep, or get ready for the next adventure. Adequate storage for personal items, room under the bed for suitcases and packs. Electrical outlets and charging outlets by the counter. TV and "Virtual Balcony" small easy to use safe for passports and other valuables. 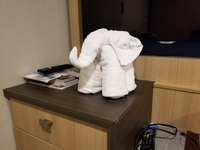 Nice shower and bathroom, great bed (slept well after hiking all over the ship each day), the "Towel Animals," I&apos;ll let you find out, great fun. Room service is good with a limited menu if you want to skip the crowd and have a quiet evening. 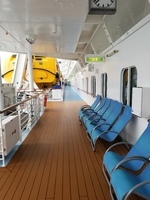 The cabin and the whole ship are clean and well maintained. Lots of useful info available on the on-board TV channels. Nice clean operation, the parking structure looks like a good deal, I had a ride in and out this trip. Security screening was smooth and the cruise people kept things moving along. Squeezing almost 6000 people on to a big boat, after they had just unloaded another 6000 people that morning, everyone was polite and efficient. Beautiful, well kept harbor. Easy-on easy-off, security and customs worked well in both directions. Due to the short stay I opted for a walk around the "Keep" which included the former British Commissioner&apos;s house and is now a museum. Don&apos;t miss the dolphins in the pools at the keep. It was nice to hang out and enjoy the sea breeze and sunshine. Will visit again when I can stay longer.